This past week, I attended an Orange Township public school board meeting in New Jersey in support of first-year teacher, Marylin Zuniga, who has been suspended from her teaching position at Forest Street Elementary School. Hundreds of Ms. Zuniga's supporters were in the room. Her offense? She allowed her third grade students to send get-well cards to political prisoner Mumi Abu-Jamal. Community members, parents, teachers, and professors spoke on Ms. Zuniga's behalf. They cited her talent and compassion as an educator, as well as the injustice of her suspension. Supporter after supporter addressed the members of the school board with passion and conviction, clearly committed to Marylin Zuniga as a teacher and deeply concerned about the education of the children in their community. Until that moment, Ms. Zuniga, who entered the profession with a stellar academic record, had been identified as a "model teacher" based on all formal observations of her teaching. No one has denied that her students were flourishing, that she was respected and valued by parents, and that she was a devoted, creative, and highly-qualified teacher. Members of the school board were visibly shaken by the outpouring of support for Ms. Zuniga. The superintendent had already suspended her, and word had been that the board was intending to terminate her. As the meeting went on and as the demand for her immediate reinstatement became louder and more insistent, the school board president announced that public comment would end at 9:30, less than an hour after the hearing began. When the audience reminded the president of the long line of speakers still waiting to be heard, she responded that, "they're all saying the same thing." Finally, after hearing from Ms. Zuniga, the board announced it would reconvene in early May. The meeting ended with supporters chanting, "Let her teach." Judging from the perspective of what was best for her students--which, of course, should have been school officials' only concern-- suspending Ms. Zuniga absolutely made no sense. Had her principal or mentors been concerned about the letters to Mumia Abu-Jamal or what a lesson about him should include--and good educators can of course have different views -- they could have sat together and discussed the pedagogic approach and curriculum moving forward. 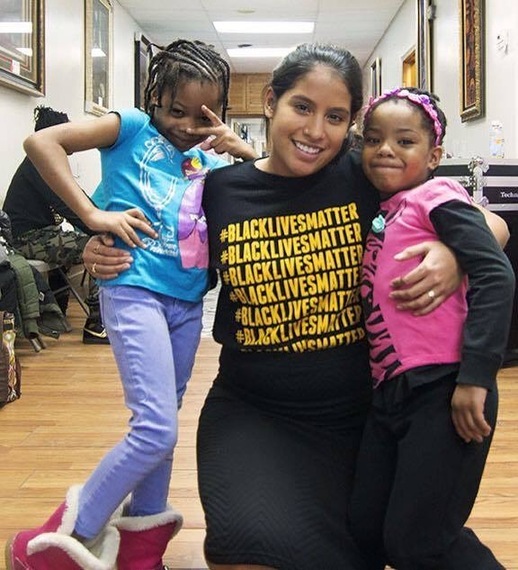 The suspension of Ms. Zuniga followed close on the heels of a public statement by the former president of the Philadelphia Fraternal Order of Police (FOP) attacking her for supporting a "cop killer." It need hardly be said that he was not speaking as an educator, but, rather, was pursuing his and the FOP's own anti-Mumia agenda. In February, my students participated in a civil rights series highlighting multiple leaders. On February 5th I presented a do-now that stated: '"What is the main idea of this quote? : 'So long as one just person is silenced, there is no justice.' This quote is by Mumia Abu-Jamal. Many of my students took it upon themselves to go home and do research about civil rights leaders discussed in class. In April, I mentioned to my students that Mumia was very ill and they told me they would like to write 'get well' letters to Mumia. Teachers, often with supervisors, review and reflect upon lesson plans all the time. This lesson offered an opportunity for a fuller discussion of teaching about controversial figures in the classroom--which would involve a discussion of who gets to determine who is "controversial" and what that even means. For example, in the case of journalist Mumia Abu-Jamal, a critically important fact is that the trial against him has been widely viewed as a travesty of justice, including by Amnesty International and other human rights organizations and leaders across the globe. Scholars and educators across the US understand the importance of social justice education in our classrooms. Many of them, including Pedro Noguera, Marc Lamont Hill, Michelle Fine, Noam Chomsky, Ofelia Garcia, signed a letter to the Mayor and school board insisting that Ms. Zuniga be returned to her classroom. The letter said: "The Orange Public Schools website explains that part of your mission is that 'the district serves all students in our schools, acknowledging their unique backgrounds, cultural perspectives and learning styles.' This culturally relevant approach is consistent with the kind of teaching that Ms. Zuniga enacts and is part of the broader field of social justice education." The educators also spoke of the importance of Ms. Zuniga's social justice work with young people outside the classroom: This work "includes the coordination of 'A Books and Breakfast' monthly program that has provided over 200 free books and 360 healthy breakfasts for Newark youth and families. She also coaches a 'Girls on the Run' program at her school, which develops self-esteem and confidence for 3rd-5th grade girls." Another group of prominent educators, including historians Robin D.G. Kelley and Barbara Ransby, in a letter organized by Educators for Mumia Abu-Jamal, said: "Nearly all scholars of African American history see Abu-Jamal as belonging to the American literary canon that includes figures and writers like Dr. Martin Luther King, Jr., Angela Davis, Ella Baker and Ida B. Wells.... Mumia Abu Jamal is legitimately hailed as the "voice of the voiceless" for black and Latino people and for many others in this country who work for what Cornel West has termed "prophetic justice" and "radical love."" At a time when the Black Lives Matter movement has brought to the forefront, and is organizing against, anti-Black violence and injustice; when our public education system is failing to meet the most basic educational needs of our students, particularly low income and students of color; when public school curricula has been dumbed-down and hijacked by high stakes testing and the corporatization of public education; when our schools are increasingly segregated and unequal; teachers like Marylin Zuniga should be celebrated, not chastised. Deeply committed to her students and to their learning, Ms. Zuniga not only deserves to be back in the classroom immediately, but her students deserve that as well. Our students' learning should not be determined by the Fraternal Order of Police or, in fact, by any outside forces with agendas that have nothing to do with our children's education or with equity and justice. *The author is working with educators and community members in support of Marylin Zuniga. Her husband, civil rights lawyer Alan Levine, is representing Ms. Zuniga.